How do I move on from literal representation? So much has happened in the past week, I feel at a loss for where to begin. The emotionally challenging instructor, or the “it” nightclub in Vegas? (Yep.) The exquisite French meal, or the many different kinds of exhaustion? I think it best to write here the way one selects food at an airport café: just pick something and go (and whatever I don’t get to now, we can return to later)! Last week I had all these emotions running through me and I wanted to get them out somehow, but I didn’t know how to do it without writing them out explicitly. I didn’t want a catalog of how I was feeling; I wanted a capture of the raw energy. Watercolors felt too restrained, pencil not colorful enough. I think if I had had more oilbars I would have used those, but I only have black, white, and forest green — not the most exhilarating palette! I do have a beautiful selection of pastels, but they make a mess and I didn’t feel up to the cleanup. So I settled on Prismacolor markers. My goal was to make fast, expressive marks to generate a feeling, without worrying too much about accuracy. I made three portraits over the course of the week, all from magazine photos. 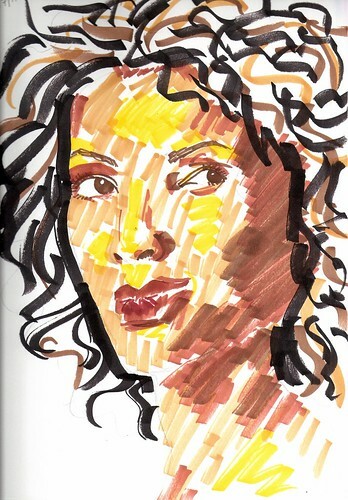 It was very satisfying to do them so quickly; I loved the physicality of the rapid mark-making and instant colors. I’m pleased at the energy in the portraits. But they’re exercises, and I’m not sure what I’ve learned from them, except that I now have a niggling feeling I should give acrylic paints another try. (No…! Not another new painting quest?! I’m still learning watercolors!) I love watercolors because they’re so meditative, but sometimes I do want to work fast and dabby and thick… well, maybe I can try using less water and see what happens. Or use gouache. I do not want to take on another pursuit right now! Anyway, this isn’t a painting problem only. 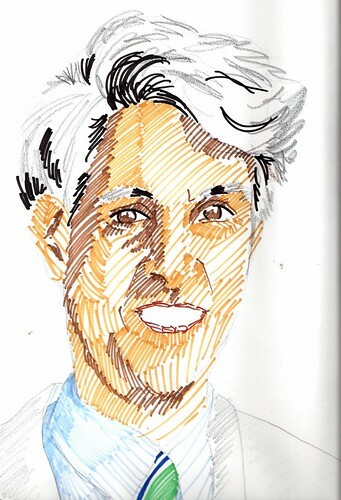 On Saturday at the IWL meeting (this time with Leticia Hernandez), we read some poetry, and I thought after one by Willie Perdomo that he accomplished what I wanted to do in my marker portraits: he evoked a feeling. I wrote in my notebook during the workshop, “I think [what this poem is doing] is what I was getting at w/the marker drawings but they’re only the tippiest tip of the iceberg — the air above the tip really, not even the tip itself. Right now my m.o. with strong sensations is to give them names and write about them but the whole point of this exercise I’m giving myself is to go backward from that, to try to get it down before I put a name to it.” The problem is that in words I’m accustomed to being quite literal, and in images/marks I’m accustomed to being representational or decorative. I don’t feel comfortable with abstraction (though some people do beautifully with it, including Erik). So I think that my language for evoking feelings — whatever that language turns out to be — is going to be rooted in the kinds of expression that are familiar to me. But what that will look like, I have no idea. step out onto the deck. That’s as far as I got before we had to move on to the next thing. I don’t know that describing an encounter with fresh air and early-morning sun is exactly how I want to evoke that refreshing lemony flavor, but as with my marker drawings, this “tippiest tip of the iceberg” seems all I can manage at the moment. I’d love to hear your thoughts. I am so struck by the portraits! I may not have a visual artist’s language for what I see, but from what you’ve written here, I think you’ll be satisfied that I simply FEEL these pictures! I was fascinated with them before I read what you wrote because they excite me and make me want to know more….. I don’t know what more, but something. If this is the tippiest tip of your iceberg, then I want so much more! They also seem different to me than some of the other works of yours that I’ve seen. Do you think it’s just the markers? Or…. ? Anyway, I don’t care what the original photos were, or were about. These sketches feel very alive for me, and I’d like to see more! I’d like to see more of your poetry, too! I’m lovin’ the expression …. period! Yay, I am really glad you are feeling the pictures (and poetry) and wanting more! I have the same response, though as the artist of course it’s a slightly different feeling. 😉 But I feel like they’re doing something for me, and I want to keep pushing and see what else I can make from this place. 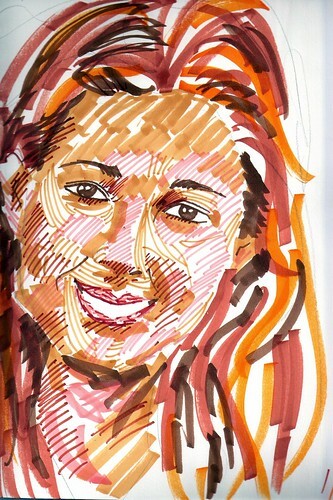 I first saw your marker portraits in thumbnails on your Flickr stream, and I was struck by how realistic they looked from the thumbnail, but then you could really see the energy and marker strokes in the full image. In oil painting class I decided to do a large-sized painting from a friend’s motion blur picture of a rainy day in Times Square. I struggled a lot with wanting to make it abstract but my brain just couldn’t let go of making the people look like people. My teacher told me to turn the painting and picture upside-down and just see the colors and shapes, and it helped a lot. I still think about attempting another version more abstract than it ended up, but that technique of letting go still works for me when I get too attached to something literal. Love seeing how you’re working through your art! The energy was so strong in your marker portraits, almost as if the people were breathing…and you’re poetry moved me, it was so simple and beautiful. I saw just continue to go with it, where ever it leads you my friend. On The Literal Presentations:Your portraits are striking, colorful, alive! The energy is loud, the expressions beautifully raw! Good morning, SomerEmpress! 🙂 So glad you are feeling life and energy in the portraits, and an awakening in the words! I should get back to the poem and see what more emerges.